8ID chief MGen. Jet Velarmino together with the Stromtroopers during the tree planting activity at Camp General Vicente Lukban, Catbalogan City, Samar last May 1, 2015. 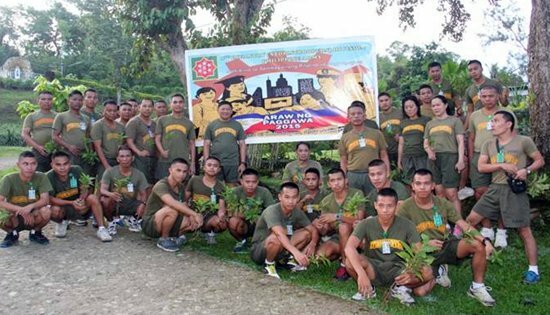 CAMP VICENTE LUKBAN, Catbalogan City – In observance of the Labor Day, the 8th Infantry Division, Philippine Army planted fruit bearing and non-fruit bearing trees at the outskirts of its headquarters, Camp Lukban located at Barangay Maulong, Catbalogan City on May 1, 2015. Maj. Gen. Jet B. Velarmino AFP, Commander of 8ID led his officers and men in planting 50 mahogany trees and 100 assorted fruit bearing trees in support to the celebration of Labor Day while at the same time in pursuance to the National Greening Program (NGP) of the government. This year, 8ID had already planted 1,390 assorted fruit bearing and non-fruit bearing trees. Since the rainy season had already started, 8ID is now implementing its tree growing activities and had directed its subordinate units to do the same. The directive also emphasized to work with other stakeholders in conducting tree growing activities in their respective areas of operation. Maj. Gen. Velarmino was delighted by the enthusiasm of the soldiers under his Command in their participation to the Labor Day tree growing activity. He said that 8ID under his Command supports the Filipino workers in advocating workers rights’ observance and in fighting for current issues that affect them. MANILA – Eight health facilities damaged by Super Typhoon Haiyan in Eastern Samar and Samar provinces have been fully restored and handed over today to local health authorities. As many as 60,000 people from seven municipalities have access to of health services at these facilities. The Albino M. Duran Memorial Hospital in Balangiga, Eastern Samar, has provided preventive and curative health-care services to at least 17,000 patients since March 2014. Additionally, seven barangay health centres – in Giporlos, Guiuan, Lawaan, Mercedes and Quinapondan in Eastern Samar, and in Basey in Samar – have been repaired or constructed. “Now that the hospital has been rehabilitated, there is no longer a need to refer patients to other hospitals. They will save money and time as our services and facilities are readily available,” said Dr. Benedicto Garcia, chief of the Albino M. Duran Memorial Hospital. The facilities were rehabilitated and equipped by the International Committee of the Red Cross (ICRC) and the Philippine Red Cross (PRC), in coordination with the Department of Health and local government authorities. In 2014, the ICRC already completed the repair of Basey District Hospital and six rural health units in Eastern Samar and Samar provinces, and provided them with medical equipment and furniture. The ICRC, jointly with the PRC, focused its response on the impact of Typhoon Haiyan on Samar Island, which is partly affected by armed violence and where the ICRC has been working for years to support the communities affected. QUEZON CITY – The biggest labor group in the country Trade Union Congress of the Philippines-Nagkaisa (TUCP-Nagkaisa) recommended that Energy Secretary Jericho Petilla be fired by President Aquino for deceiving the public with his calls for an emergency powers resolution to address a non-existent power crisis. Secretary Petilla had warned about brownouts from March to April 2015 while the Malampaya complex underwent improvements. “Secretary Petilla duped us. He is accountable for scaremongering the entire nation on his emergency power resolution since August of 2014. The “crisis” period has come and gone without requiring use of the Interruptible Load Program and with no brownouts. He must go for misleading the President and for wasting the valuable time of Senate and House of Representatives from July last year to the present on hearings and deliberations on his non-existent power deficit that could have otherwise spent on addressing social legislation and other vital concerns. He no longer deserve the people’s trust,” said TUCP-Nagkaisa national spokesperson Alan Tanjusay. By raising up the red flag on our power situation, Secretary Petilla scared potential investors who stayed away bringing with them along lost opportunities for the unemployed. The recommendation will be made before the scheduled cabinet meeting on April 30th. In September last year, Petilla formally asked congress to grant emergency powers to Aquino to contract additional power generating capacity to address alleged shortage of up to 600 mw in summer this year by purchasing or leasing power generators. If Petilla have gotten his away we will be paying for additional P6 to P12 billion in power that would not have been needed, he said. The group accused Petilla of pushing expensive solutions that would have burdened the consumers. “He has already cost us billions by scaring away investors,” Tanjusay said. However, the projected energy deficit was met with the implementation of the Interruptible Load Program (ILP) which had not require passage of an emergency powers resolutions. Under the ILP large commercial and industrial establishments would deload from the Meralco grid and use their own generators to free up electricity for household use. TACLOBAN CITY – The National Maritime Polytechnic (NMP), a premier government maritime training and research agency located at Brgy. Cabalawan, Tacloban City, and its Satellite Office in Makati underwent the re-certification audit of its Quality Management System (QMS) under ISO 9001:2008 by the Anglo Japanese American (AJA) Registrars Limited on April 21-23, 2015. NMP’s quality procedures and manuals and other system documentation have been reviewed by AJA Lead Auditor Capt. Nicanor Altares against the requirements of the relevant standards. He looked into the Agency’s several processes including enrollment and registration procedures, course delivery (training), assessment/examination, documentation, provision of resources, issuance of certificate of completion, post delivery services and other administrative support services during the audit. Although there had been some observations and minor corrective action requests (CARs) cited, the audit report recommended for re-certification status for NMP. During the exit conference with Capt. Altares, NMP OIC Executive Director Manuel Roldan expressed his appreciation to the lead auditor for his objectivity in the performance of his task. “This is not only an audit per se but a help to NMP for us to continue to improve on our QMS,” Director Roldan disclosed. First received its ISO certification in 2000, NMP has continually passed several surveillance and re-certification audits until this recent achievement. The Agency’s Quality Management Section through its Quality Management Representative is tasked to oversee the compliance of the Agency to its quality management system. AJA Registrars Limited is an independent third party registrar (certification body) accredited to perform ISO 9001:2008 assessments. ISO 9001:2008 is now well-established as an internationally-recognized Quality Management System (QMS) standard that provides benefits through continual improvement, consistency in supply and increased marketing power. ISO 9001 is focused on ensuring that the business delivers a consistent level of quality to its customers by having well defined and regularly reviewed processes and procedures. The system fully integrates within the existing business procedures and becomes part of the culture within the organization. Lt. Col. Nedy Espulgar, Vice Mayor Winston Menzon, Mayor Charita Chan, Col. Arnulfo Matanguihan, PSupt. 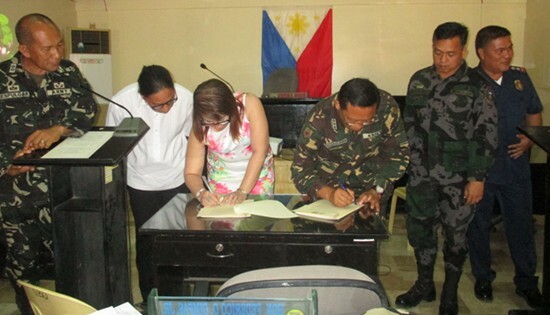 Denis Jose Llavore and PSI Delfin Dinky Boy Bardillon during the signing of the declaration of Babatngon, Leyte as insurgency-free municipality on April 201, 2015. The signing was held at the SB Session Hall of Babatngon, Leyte before the SB members, PNP and AFP personnel as well as town hall employees. ORMOC CITY – Figure of Leyte towns which were considered “cleared” from insurgency affectation has significantly increased, the military said. This when Local Chief Executives and Colonel Arnulfo Matanguihan, deputy commander of the 802nd Infantry Brigade inks Memorandum of Agreement (MOA) declaring Julita and Babatngon as insurgency-free municipalities on Monday, April 20. The said official and Police Superintendent Denis Jose Llavore who represented the Director of the Leyte Police Provincial Office, signed both MOAs amidst simple occasions separately prepared by the concerned LGUs. Colonel Matanguihan cited that better services and the participation of all stakeholders in addressing social issues are the key factors of the Local Government Units (LGUs) success in preventing entry and resurgence of the communist terrorist movement and other lawless groups. In the military’s assessment, Babatngon and Julita towns which are under the area of operations of the 19th Infantry Battalion and 78th Infantry Battalion, respectively, were already “cleared” since year 2000 or even earlier as some LGUs claimed it. The proximity of Babatngon to Sta. Rita, Samar which is just a thirty-minute ride via motorized boats, stereotyped the town as among the lawless groups’ mobility corridors. But in her message during the MOA signing, Mayor Charita Chan recounted how the peace and order situation of her town were ably maintained by municipal police and the barangay tanods. The three-termer mayor likewise described the dwellers as peace-loving constituents. Similar to Babatngon, the municipality of Julita also accomplished the imperatives contained in the AFP-PNP Joint Letter Directive entitled: “Guidelines in Evaluating the Implementation of Internal Security Operations (ISO) Campaign Plan against the Communist Terrorist Movement”. Lt. Col. Nedy Espulgar and Lt. Col. Allan Jose Taguba, commanding officers of 19IB and 78IB respectively, said they are eyeing the declaration of other towns and even cities as insurgency-free the soonest possible time. As of this posting, 11 towns in Leyte are already formally declared insurgency-free. The said towns are Matag-ob, Merida, Palompon, Matalom, Bato, Inopacan, Dulag, Tabon-tabon, Tabango, Julita and Babatngon. TACLOBAN CITY – The National Maritime Polytechnic (NMP), a premier government maritime training and research agency located at Brgy. 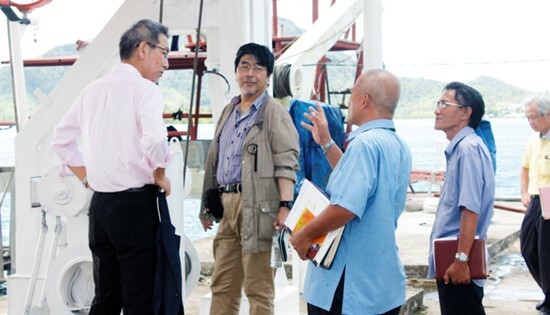 Cabalawan, this City, welcomed Yasuo Nakajo, General Manager of the Japan Marine Science, Inc. and consultant to the Japan International Cooperation Agency (JICA), and eight (8) contractors from M.E.S. TOKKI Co., Ltd., Mitsui Engineering and Shipbuilding Co., Ltd. and Terasaki Electric Co., Ltd. on April 21-23, 2015 to discuss the preparations for the installation of the training equipment donated by JICA. The visit embarked on a site inspection by the Japanese contractors in the NMP Training Complex and a meeting where NMP Key Officials led by its OIC Executive Director Manuel C. Roldan discussed the preparations to be performed by both NMP and the Japanese contractors relative to the installation of the training equipment. Together with Mr. Nakajo were Fujiwara Takahiro, Tanaka Yosuke, Simizu Hatski, and Hattori Tsutomu of M.E.S. TOKKI Co., Ltd.; Shirai Junji of Mitsui Engineering and Shipbuilding Co., Ltd.; and Ueda Masayoshi, Uenishi Hisao, and Akeno Katsuhide of Terasaki Electric Co., Ltd. The Japanese government through JICA is donating a Fast Rescue Boat with Davit, Totally Enclosed Lifeboat with Davit, Full Mission Engine Room Simulator, Global Maritime Distress and Safety System (GMDSS) Simulator, and various safety equipment. These are expected to arrive and be installed at the NMP site by October 2015. The new and upgraded equipment will be a boost to the capability of NMP to provide quality training to seafarers in accordance with the STCW required standards. The pursuit of this project is based on the Grant Aid Agreement entered between NMP and JICA for the implementation of the former’s Programme for Rehabilitation and Recovery from super-typhoon Yolanda. Aside from the preparatory activities to be undertaken for the installation of the equipment, other concerns such as provision of a temporary office and rest space for the installation technicians, communication facilities - internet connection, and disposal of waste materials from the installation work were also raised and to be attended by NMP. NMP committed to complete all of the agreed preparatory activities by the end of August 2015. QUEZON CITY – It will augur well for the government to immediately convene the National Security Council (NSC) to map out plans in the face of China’s aggression over the West Philippine Sea. Escudero, chairman of the Senate Committee on Finance, said the government must push through with the arbitration process of the territorial dispute, and this must be done in coherence with all key players, starting with the government. “It might indeed be best to convene the NSC in order to bring everybody in the loop given that this is an issue facing our country and people regardless of political affiliation,” Escudero said. Under Executive Order No. 115, the NSC is the principal advisory body of the President on the proper coordination and integration of plans and policies affecting national security. Escudero supports the government’s position to defend the country’s claim over parts of the potentially oil-rich South China Sea, which are also claimed in parts by Malaysia, Vietnam, Brunei and Taiwan. “All branches of the government must work together in unison. We bring the best minds, the soundest judgment, and the best intentions for the country to stand at its best on an issue that is every Filipino’s claim,” Escudero pointed out. China has been relentless in taking control of most parts of the disputed areas through reclamation works and construction of military facilities. Last week, Filipino fishermen were water cannoned by a Chinese vessel to drive them away from the Scarborough Shoal. The Armed Forces of the Philippines also said they have photographs taken by satellites to show that China has aggressively built infrastructures on reefs and islets, including airstrips and key military facilities. The senator said it is imperative that the government bring the issue to the proper forum through diplomatic means. He said getting international attention and support from the United States and regional partners in the Association of Southeast Asian Nations (ASEAN) will definitely play an important role in keeping China at bay. “International attention and support will play a key role to pressure China to conform to international laws and practices. It could also temper them from their bullying tactics and convince them to resolve the matter peacefully,” Escudero said. TACLOBAN CITY – From a recent study conducted by the National Maritime Polytechnic (NMP), a government maritime training and research agency located at Brgy. Cabalawan, Tacloban City, it revealed that 82% of its seafarer-trainees are easily absorbed into sea-based jobs after completion of their training and 84% of them have jobs related to skills acquired. The said study, aimed at determining the impact of NMP training to the employability of its graduates, also established and compared the profile of graduates from 2007-2011 ‘before’ and ‘after’ training at NMP. It showed that most of the seafarers undergoing training at NMP are males, pegged at 98%. About 63% of these graduates are single; only 35% are married. Most of them come from the Visayas regions where 48% are from Region VIII and 28% are from Region VII. In the educational attainment profile, 37% of them are Bachelor of Science in Marine Transportation (BSMT) graduates. Only about 15% are Bachelor of Science in Marine Engineering (BSMarE) graduates. The study also revealed that before undergoing training there was only about 14% of the seafarer-trainees who have licenses and 48% of them are employed. After training at NMP, 33% have already secured licenses and about 90% are employed. The said study is a follow-up research undertaking conducted in 2007 which also established the profile of NMP graduates during training from 2003 to 2006; determined the knowledge and skills acquired by NMP graduates from every training course and the graduates’ employment, absorption and skills utilization rates, employment mobility in terms of progression in license and rank; and identified the benefits obtained by graduates from training courses taken at NMP. In comparison of the findings of the tracer studies between 2007 and 2014, data revealed that the latter tracer study shows improved employment-related outcomes compared to the 2003-2006 graduates. There is an increase in the skills utilization rate at 8%. Skills utilization rate refers to the percentage of employed graduates in a given period whose jobs are related to skills acquired. Absorption rate has also increased at 6% from 76% to 82%, respectively. Absorption rate is defined as the percentage of certificated trainees who get a sea-based job after completion of training to the number of graduates who were not employed prior to completion of training. With the present study, the NMP Maritime Research Section plans to embark on continued and more comprehensive conduct of similar tracer studies to determine the progression rate of employability-related data of NMP graduates and the relevance and importance of the trainings offered by NMP to the requirements of the industry. Memorandum Signing Ceremony for the Future Leaders of Toledo Project with signatories (left to right) Ramon Aboitiz Foundation Inc. Kool Adventure Camp (RAFI-KAC) Director Edvan Loh, RAFI President Roberto Aboitiz, Carmon Copper Corporation (CCC) Vice President and Resident Manager Rodrigo Cal and CCC Vice President on Human Resource and Administration Rene de Ocampo. CEBU CITY – To better equip themselves in implementing community projects at the barangay level, 70 student leaders from Toledo City, Cebu will start undergoing this month a Three-Phase Youth Leadership Development Program organized by the Carmen Copper Corporation (CCC) in partnership with Ramon Aboitiz Foundation Inc - Kool Adventure Camp (RAFI-KAC). The program is a long-term investment that starts with an initial three-day training to strengthen fundamental personal skills for effective personal leadership and self-confidence; to conquer personal fears; and for them to gain deeper understanding of their selves to become active and effective members of a team. “This partnership is one more step in injecting into the community a program that produces significant transformation. I can guarantee that participants of this program will never be the same when they complete the training. This program creates people free from the normal human constraints which hold them back from becoming what they can be. 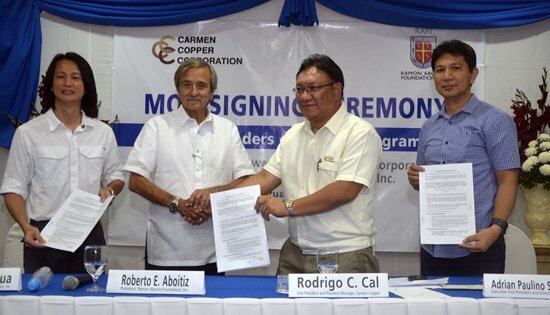 We are very excited to be part of this program and thankful to Carmen Copper Corporation for engaging us,” said RAFI President Roberto Aboitiz. The second phase of the training is designed for participants to learn the basic principles of project management for to create initial assessment of their local communities and to craft project proposals for implementation. Outstanding project proposals will be given counterpart seed funding by CCC. The third and final phase of the training will gather project team leaders for them to share their best practices on project implementation and provide them opportunities for network building. Outstanding projects will be recognized during the awarding ceremony by end of the year. “These projects are really for the benefit of the community. In terms of training activities, this will have a mix of indoor activities, knowledge building, while a large part of it is sending the participants to the community to practice the skills they learn,” said RAFI-KAC Director Edvan Loh. The participating national high schools are from the barangays of Don Andres Soriano, Cantabaco, Bunga, Media Once, Magdugo, and General Climaco and private school De La Salle Andres Soriano Memorial College. “We are very impressed with the program of RAFI-KAC. We in CCC want to develop the youth to become the future leaders, and we want to do this in collaboration with RAFI,” expressed CCC Vice President and Resident Manager Rodrigo Cal. “This is a highly-sophisticated and productive kind of training that will help supplement and complement our already established school curriculum for our high school students,” also said Department of Education-7 Education Program Supervisor Victor Intig. The partnership was sealed through the signing of a memorandum of agreement between CCC and RAFI last February 11 at the Cebu Grand Hotel.